The Gutter People is a second-generation family owned and operated company specializing in seamless aluminum gutters and gutter protection. Since 1979, we have been protecting homes in Windham, ME and all of Southern Maine by providing quality guttering services at competitive prices. Our philosophy and goal since the beginning has been to treat our valued clients the way we want to be treated. As home improvement professionals, we do this by providing high-quality products that deliver true value and customer care that stays with you long after the sale. 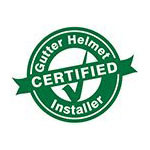 We’re proud to be Southern Maine’s exclusive authorized dealer for Gutter Helmet®, the first, best and most installed gutter guard brand in the world. They have been the number one choice in American gutter protection for over 30 years, and they deliver on their promise: Never Clean Your Gutters Again®, guaranteed! The Gutter People also installs seamless aluminum gutters precisely engineered to fit your home and hold up well through the harshest weather. Our seamless gutters are available in a wide range of colors to complement your home, providing beauty as well as functionality and round-the-clock protection. Our service area includes Portland, Saco, Brunswick, Kennebunk, Bridgton, Auburn and the rest of Southern Maine. If you live in any of these areas, The Gutter People has you covered. Call us today at (800) 824-3772 for more information about our gutter protection services and other offerings. Our hours of operation are from 8:30 AM to 4:00 PM, Mondays through Fridays. You can also fill out our online form to schedule a free in-home consultation with one of our sales representatives.